Dovetail. No doubt you have heard this word used in common phrases and chances are you own a piece of furniture that is put together using this construction method. Dovetail is a type of joint that creates a tight interlocking connection, similar to interlacing the fingertips of your hands. The name comes from the triangular shape of the joint “fingers” resembling the shape of a bird’s tail. Dovetail joints allow you to see how the wood is held together giving the corners a zipper like aesthetic as opposed to a doweled drawer, where the connecting points are hidden. The top edges of dovetail drawers are sanded and smoothed to a rounded edge known as a bull nose. There is no edge banding on Dovetail drawer boxes which means you get an authentic look at the wood your drawer is made of. This creates a subtle natural look and feel in your bathroom or kitchen cabinets. The best part? 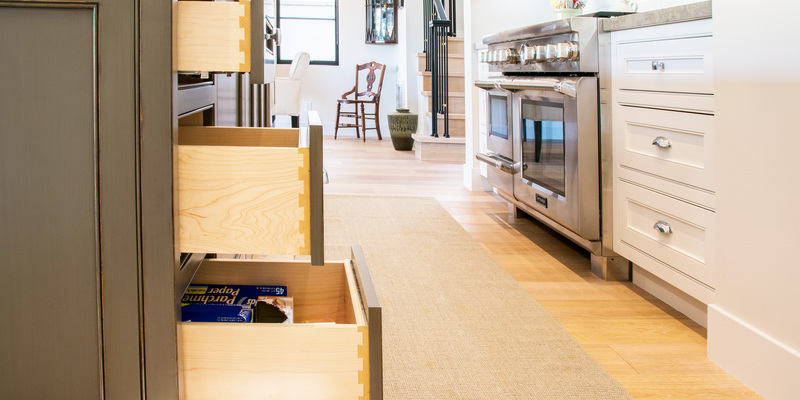 Dovetail drawers work with any style, whether you are going traditional or modern. Popular materials for dovetail drawer boxes and roll out trays are Prefinished Baltic Birch plywood and Solid Wood Maple. Baltic Birch plywood is known for its layered look which is visible both in the interlocking joints as well as the sanded exposed edges. Solid Wood Maple, on the other hand, has a solid smooth wood finish. Don’t heritage to contact us for more information about Dovetail Drawers. You are more than welcome to visit our showroom and take a look at what we can help you in your new cabinet project. both for large-scale projects such as hotels or shopping centers and for small-scale projects, such as renovating the kitchen at home. Any project is very important for quick cabinets, so we will always give a high quality in all our materials and services. For inspiration.